Real Analysis is a discipline of intensive study in many institutions of higher education because it contains concepts and fundamental results in the study of mathematics, geometry, physics, and similar technical disciplines. This book solves mathematical analysis problems with related main software packages such as Maple. Besides the fundamental theoretical notions, the book contains many exercises, solved both mathematically and by computer, using Maple and other programming languages. 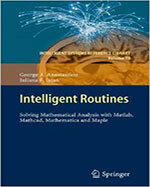 The book is divided into nine chapters, which illustrate the application of the mathematical concepts. Each chapter presents the fundamental concepts and the elements required to solve the problems contained in that chapter. It finishes with a few problems for the readers to solve.